On Friday, after putting HUGs in mailboxes and bringing breakfast treats, I decided I wanted to spread some more cheer. There is a bathroom at the end of the hallway that is just depressing looking inside.... and don't know about you, but I very much dislike school soap. Over the summer I bought some Bath and Body Works soap in fun scents to keep in my office. Before I moved downstairs to the Student Services Suite I had a sink in my office. They kids enjoyed using fun smelling soap. I got the idea the other day to "donate" my scented soap to this dismal bathroom. Then on Friday, when I was on my way to take the soap to the bathroom I got an idea. I turned around and went back to get my window markers. I drew a sun, some clouds, grass and flowers on the bathroom mirror. I also wrote " Have a great day!" on the mirror. (It is hard to see in this picture because of the reflection of the paper towel holder.) I put my Citrus Blueberry Swirl soap on the sink. 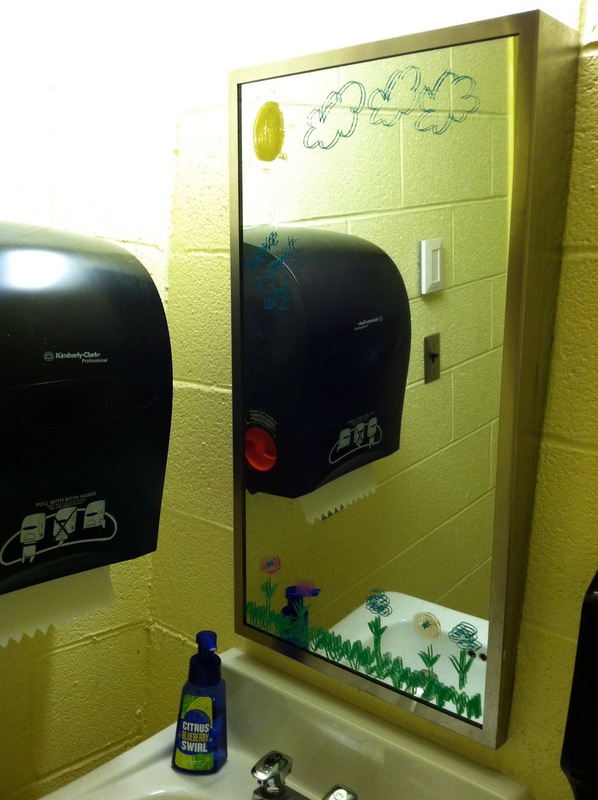 I am planning to do this to some of the other bathrooms too. I'll let you know what the reaction is. I love this idea Danielle! I am broke right now but I am sure that I could manage some positive and inspirational quotes or something : ) Thanks for the idea and morale booster! After i read this, i tried it & its great! Love to stay my bathroom for long now.